JAKARTA, -- Within the framework of military-technical cooperation in accordance with the contract signed in September 2016 specialists of the holding "Russian Helicopters" (part of the State Corporation Rostec) started arrangements for the transportation of Indonesian Mi-35P to the territory of the Russian Federation. In accordance with the terms of the contract overhaul of Mi-35P helicopters will take place at the production facilities of JSC "150 Aircraft Repair Plant". On November 28, 2016 representatives of the Indonesian company together with the specialists of JSC "150 ARP" started to perform dismantling, conservation, loading operations of helicopters and their components. "In the market of South-East Asian countries, there is a stable demand for Russian helicopters. We promptly and efficiently to fulfill its contractual obligations to repair helicopters produced in Russia, as well as provide services for the services, "- said General Director of the holding company" Russian Helicopters "Alexander Mikheyev. 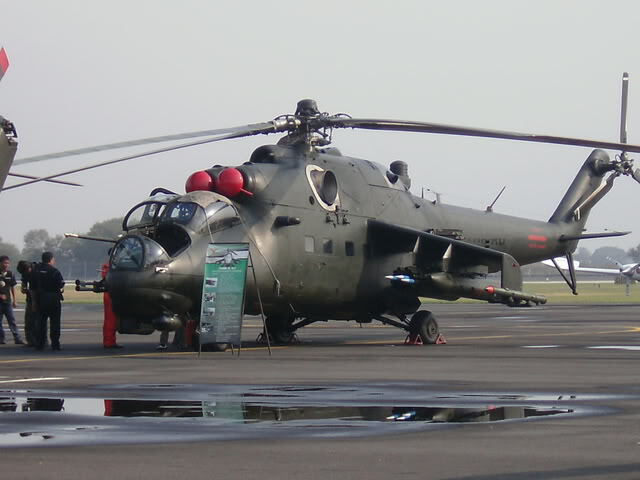 The first combat helicopters Mi-35P were delivered to Indonesia in September 2003. 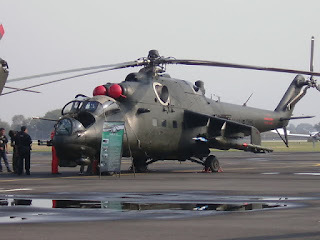 Within the framework of the intergovernmental agreement in September 2007, Indonesia has ordered another three Mi-35P, which were delivered in September 2010. The official ceremony of the Indonesian army transfer took place at the air base ground troops in Jakarta Pondok Chabe 20 October of the same year. Within the past this autumn forum "Army 2016" Russian holding company signed contracts for the supply of aviation equipment for helicopters, standing on the arms of the Indonesian Army. The contract with the Indonesian side will deliver sets of rotor blades in order to ensure operation of Mi-35P helicopters. In accordance with the terms of the contract, deliveries will be made during the second quarter of 2017. The Republic of Mi-35P of the Indonesian Army Mi-35P (Hind-F) gunship helicopter version.